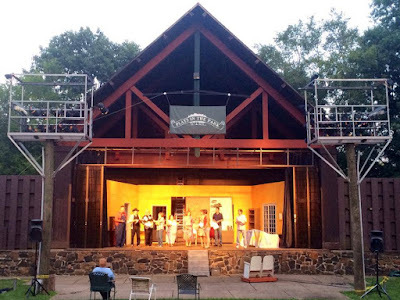 Auditions for Trilogy Repertory’s summer production of Lerner and Loewe’s “Brigadoon for Bernards Township’s Plays in the Park will be held at the Bernards Township Community Center, 289 South Maple Avenue, Basking Ridge, NJ, on May 5 and 12, from 7 - 9 pm. Auditions are for those fourteen and up, and actors should come prepared to sing 16 bars of a song from a standard Broadway musical and be ready to read from the script and dance. If you cannot make these auditions, send your audition tape to director Jaye Barre at JayeBarre@aol.com or call 908-217-2714. This is a special year for Trilogy Repertory Company as “Brigadoon” will also be presented at the new Fellowship Cultural Arts Center on July 26, 27, and 28, in addition to Pleasant Valley Park on August 1, 2, 3, 8, 9, 10. Trilogy Repertory Company will hold auditions for Bernards Township’s Plays in the Park production of “Brigadoon” on May 5 and 12, from 7 - 9 pm, at the Bernards Township Community Center, 289 South Maple Avenue, Basking Ridge, NJ. Production dates: Fellowship Cultural arts Center on July 26, 27, and 28, and at Pleasant Valley Park on August 1, 2, 3, 8, 9, 10. Contact director Jaye Barre at JayeBarre@aol.com or 908-217-2714 for information.